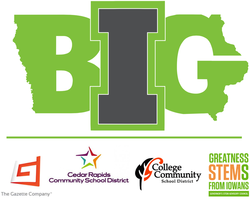 A student-led initiative in Cedar Rapids, the Iowa BIG team is focused on bettering ACEs education and efforts in our community. Iowa BIG's efforts began in 2014 when the College Community School District approached the group about collaborating on raising awareness about ACEs research. Soon after, the project blossomed at Iowa BIG and the group has had the opportunity to partner with United Way of East Central Iowa and the Cedar Rapids School District to create videos and speak to community members about ACEs. After being approached by College Community, the team dived into the data and began to discuss the astounding research around ACEs. This definitely propelled the team's efforts. The huge range of ACE scores and the effects that could be identified at Iowa BIG hit home for the team. One of the key learnings Iowa BIG discovered is the lack of required ACEs education for Iowa's educators. The people who have the most contact with children usually aren't aware of ACEs and if they are, they don't completely understand how to apply that learning. One of Iowa BIG's ACEs projects is to create a computer module that will be used in community schools to inform and gather data on children's knowledge of ACEs. The module will use Marvel superheroes and Disney characters to connect with children and show the long term effects of ACEs in a child-friendly manner. A long-term goal of BIG is to one day pass legislation that all educators and professionals dealing with children have to attend a training regarding ACEs before they can assume their position. All of the team's efforts are on a voluntary basis. For any financial needs, it utilizes the resources of Iowa BIG. The teaching staff is employed by the College Community and Cedar Rapids District to collaborate and help lead our efforts. To learn more about this project, contact Shawn Cornally, the ACEs team teacher, or Abby Murdock, the ACEs team lead. Learn more about Iowa BIG at www.iowabig.org.